Does he maybe have a site or a FB page where you can see the products? I use a 50 Watt spotlight unit with the dimmer from Gator Pro. I have never used or seen the green LED products for gator hunting, it does sound interesting. I would be interested in any input from users. I keep the light on high power when spotting, but once I see a potential target I immediately dim the light down and keep the beam from pointing directly at the gator until I get the boat close. Normally my rider is throwing the Harpoon, and they use a very dim battery headlamp to keep track of the eyes. Right before time to throw I turn the beam on high and shine the gator to give my rider good lighting for the harpoon throw. I like this light for frogging too, I use the same general dimming plan to keep the frogs from ducking on me. I have a real bright LED headlamp to that provides a nice flood, but I only use it for navigation on plane at night. I find the spot light helps me focus better on individual spots when frogging, with the LED the whole scene is lit up and their eyes get drowned out by all the light. Old school but simple. Whatever you do, do not go with a white LED system for gators. Even if they are dimmable, the light remains white. With the halogen bulb, dimming them makes the light yellow. Some quick googling says gators are green-red color blind. Since yellow is right between red and green on the wavelength chart, I guess that explains why this scheme works. The 100 watt is too much for frogging and gator hunting, but better for navigating. 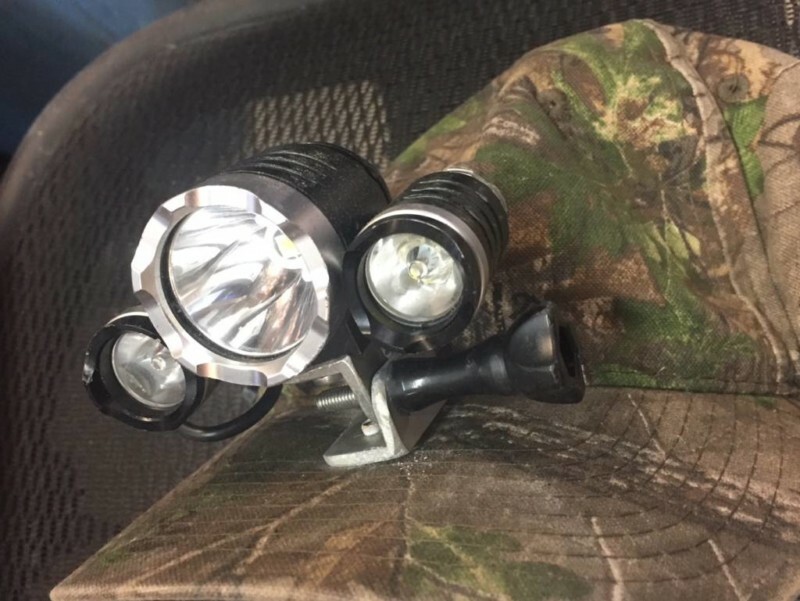 The dimmer lets you turn them all down either way, but you have to resist going to max on a 100 W when hunting, it kills your vision when time to dim it. Talk to them, they will mix and match reflectors for different beam angles and the bulbs. Bulbs are cheap so you can get a range. P.S., my LED is from Lightheaded. He sold the business 2-3 years ago but the new guy has not seemed to advertise and push it. I might have the number somewhere. I was certainly wondering about that. Was wanting to buy from Kenny. airboatman631 wrote: Simple Heritage Outdoors LLC. I took over the business from Lightheaded 3 yrs ago. I still build the same lights he did with some new extras. AND, we have the best customer service in the business!!! When you have an issue you talk directly to me, and we resolve any problems as quickly as possible. Thanks for providing your contact info, now I don't have to look through 3 years of notes! For the record, I had an issue with my light about the time James took over. Called Kenny and he gave me James' number. When I called James, about it he was willing to warranty the product and fix the issue, even though I had not bought it from him. But, while on the phone I gave the power cord a good look over and found a place it had gotten pinched, so I just repaired it with the soldering iron and heat shrink saving hassle for all. Put me down as a satisfied customer, the light is great for riding at night, it is one bright white light. I don't expect one product to do everything great, so I do swap to the old school lamp for frogging and gator hunting. It's good to have a spare on hand either way. I just double checked that and I use a narrow beam reflector with a 55 watt bulb and dimmer. I did make one modification to the LED light. I kept adjusting the light up/down (up to ride, down to look around boat). The metal bracket finally fatigued and broke. I used a thumbscrew out of a bag of GoPro stuff and made an adjustable bracket.